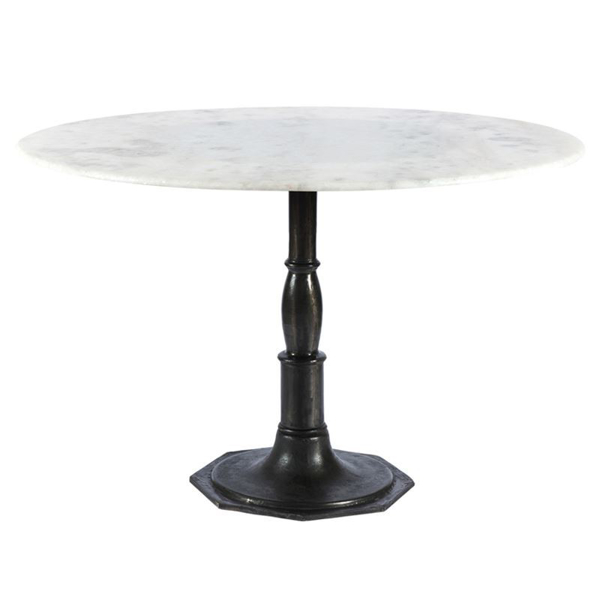 Beautifully detailed, 8-sided cast iron pedestal supports a dramatic white marble top with a bull-nosed edge. Art and functionality come together in the form of evocative, upcycled furnishings. Tabletops and flat surfaces feature one-of-a-kind antiqued metal patinas. Refurbished steel, cast iron, cogs and footings from old factories or warehouses connect the feeling of each piece back to the original use and origin of the materials. Dimensions: Dia. 48" x H 30"